Chalet "Pensées des Alpes" sleeps 12 and is conveniently located only a 5 minute drive from the town centre and 7 minutes from the Grand Massif Express ski lift that connects you to the wider Grand Massif, which has some of the best skiing in the Alps. In the summer, you can join several local trails from the house. The Samoens area is also a great hub for adventure sports such as hiking, mountain biking, climbing and paragliding. There are 2 sitting rooms with glass fronted fireplaces, 2 fully equipped kitchen (with dishwasher) with dining areas, 4 bathrooms, separate WC and a sauna room with sauna, massage shower and a wooden retro cold/hot water tub. There are a number of balconies one of which has a good size wooden outdoor dining table. This wonderful property can be split into two apartments, particularly useful for large groups or for staff / catering options. The chalet boasts two fully equipped kitchens and living / dining areas. The house sleeps 12 and we also have an extra baby cot for younger guests. The bedrooms are: Master bedroom with ensuite bathroom and loo sleeps 2. a double bedroom with shared ensuite, sleeps 2. A bunk room with shared ensuite, sleeps 2. A double bedroom with superb views, sleeps 2. A large bunk room, sleeps 4. 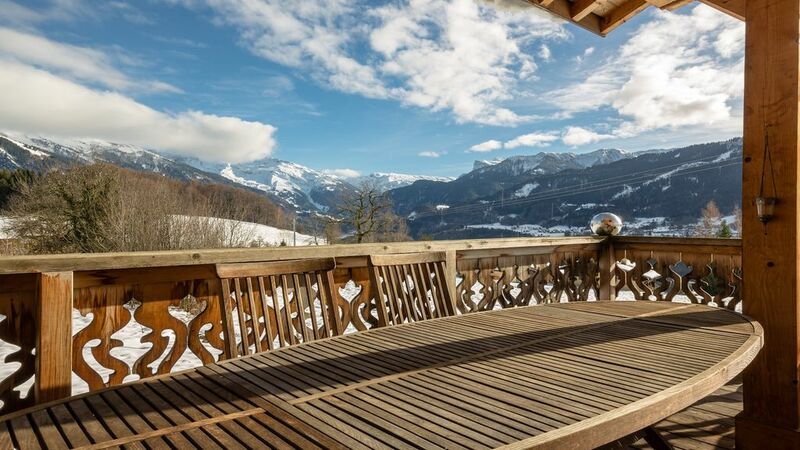 This chalet is in a stunning location, situated in a raised panoramic location giving you some of the best views in all of Samoens, only a 5 minute drive from the main ski lift. This is a dream location. We prefer a Sunday changeover day for this chalet but please contact us as we can sometimes be flexible and welcome you on a different day. This chalet is available for rental through Mountain People. We offer an exclusive hand-picked selection of beautiful chalets in the Samoens area. These unique homes are beautiful & comfortable. Whatever your requirements, we should have something to suit your needs. You can also visit www.mountain-people.com for more photographs, floorpans and information. Situated in the small hamlet of Mathonex in the heart of the French Alps, the house provides guests with just enough seclusion from the town, but is also close enough to visit restaurants and bars if so desired. Activities for families, adventurers and food lovers. We love the fact that there is never a lack of things to do and places to explore... enjoying the wilderness and a whole host of sporting activities which include skiing, motorcycling, trekking and paragliding. We value the ability to have a jam packed day, while being able to retreat to the comfort of a beautiful secluded place away from the noise of the town. Wonderful property in good location. Nicely decorated with personal touch, resulting in a very cosy and at-home setting. Wonderful fireplace. And privatey owned so very well-equipped! The only - small - downside is the lack of a shower in the master bedroom. All in all, a lovely chalet to spend time with your family both for skiing and for relaxing. Pensées des Alpes was definitely one of the most comfortable and lovely chalets we have stayed in during our many visits to the French Alps! It was the ideal for our large group of 12. Great alps style, plenty of space and bedroom options and we adored the location. The views over towards Samoens were delightful even from the bath! The drive up to the chalet is magical, particularly when covered in a blanket of fresh white snow. We were happy to discover a backgammon set and board games and the chimney fire is so cosy in the evenings. The Mountain People team really made us feel welcome (and promptly fixed a minor plumbing issue during our stay). We will return one day for sure! Very charming place, well equiped, beautiful view. Very charming chalet in a quiet place not far from the town where all facilities for winter sport take place (10 minutes driving). The property is very well equiped, especially the kitchen, and clean. The relationship with the owner and manager are easy and evrything is done to make the stay pleasant. I will recommend this property to a friend. Trés beau chalet, confortable, douillet et bien équipé où nous avons passé une bonne semaine avec notre famille. Het huis ligt op een mooie plek met prachtig uitzicht. Het huis is van alle gemakken voorzien. Ook de service van manager is geweldig. Gemakkelijk en prettig contact. Ook met de contactpersoon in Samoëns was het contact prettig. Samoëns is een mooie plek en er is (in de zomer) van alles te doen. We zouden graag terug willen komen naar deze mooie plek! We provide a house manual, containing all of our favourite activities and restaurants for both Winter and Summer. DEPOSIT & TERMS OF BOOKING 1) A £500 (or €600) deposit confirms the booking. Until the deposit is received the booking is not confirmed. The deposit is not refundable in the event of cancellation. 2) The agreed rental amount must be paid in full at least 60 days prior to check-in. If the agreed rental amount is not paid 60 days before check-in, the booking will be cancelled and the deposit forfeit. 3) After payment of the agreed rental amount, a 50% refund of the rental amount less money transfer fees will be given in the event of cancellation up until 7 days prior to check-in. If the holiday let is cancelled within 7 days of check-in, the full rental amount will be forfeit and the deposit returned. 4) Upon the payment of the full rental amount the deposit will be retained as a ‘security deposit’ against damage, breakages and breach of the terms outlined in the holiday let agreement. The security deposit will be returned in full after check-out, minus any deductions for a breach of terms outlined in the holiday let agreement.